(Brian Maffly | Tribune file photo) Latigo Wind Park, a new 27-turbine power-generating project outside Monticello went on line in 2017. The 62-megawatt project provides electricity to Rocky Mountain Power. 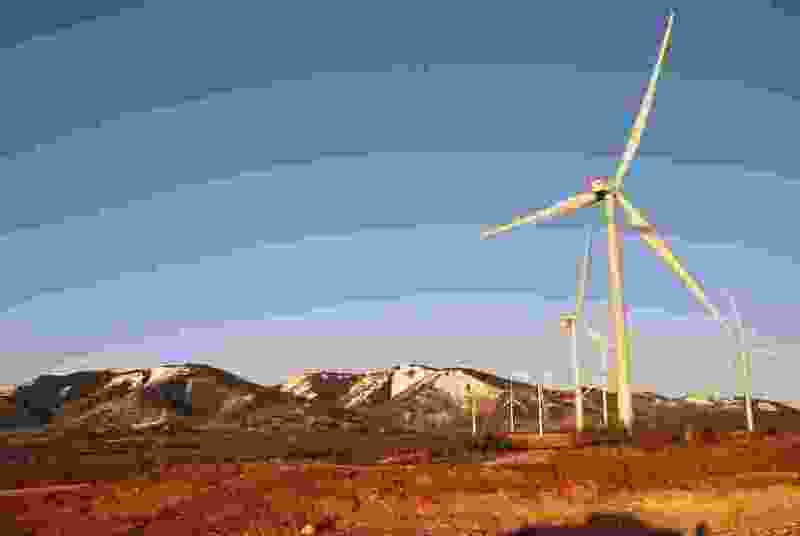 Operator Sustainable Power Group, or sPower based in Salt Lake City, has hired observers who can shut down turbines when eagles are present. Monticello • In this rural redrock town where buttes form the boundaries and windmills stand like a picket fence on the horizon, the largely Republican – and primarily white – residents are angry and resentful and frustrated. For more than three decades, they’ve been the dominant political party in this remote desert corner of Utah. For the first time, they’re likely to be overthrown. “He’s skewed everything in favor of the Democrats,” added Zeb Dalton, 39, still wearing his tan cowboy hat hours after he’d finished work for the day at his cattle ranch. “He stabbed the citizens of San Juan County in the heart the best he could,” suggested Kelly Laws, who won the GOP nomination to run for the commission seat in District 2. (Courtney Tanner | The Salt Lake Tribune) San Juan County delegates vote for commission candidates during their convention in Monticello on Thursday, April 5, 2018. The 60 Republican delegates for the county met in the cafeteria of Monticello High School – which sits inside the only remaining guaranteed Republican stronghold and the only new commission district with less than 50 percent Navajo voters. The convention was 50 miles away from the reservation, about as far as you can get in the sprawling southeastern Utah county, and in a city named for Thomas Jefferson’s slave-run plantation in Virginia. “We hear people saying that Native Americans are not capable, which is not true,” responded James Adakai, chairman of the San Juan County Democratic Party and president of the Oljato chapter of the Navajo Nation in Utah. For too long, he said, tribal issues have been ignored by the majority-GOP commission. Roads on the reservation are in desperate need of repair and school bus routes can take up to two hours one way for native students. The county, overall, is at least 50 percent American Indian and 47 percent white, according to the most recent census data. In January 2012, the Navajo Nation filed suit armed with those population numbers, alleging that San Juan violated the Voting Rights Act by ensuring that non-Indian voters held majorities on the commission and nonpartisan school board — the two most powerful government bodies here. He also required that all seats be vacated and a special election be held in November. Nearly every Democrat running now is American Indian. No Republican candidate is. Certainly, the court ruling has set off new tensions between the mostly liberal tribal members and the staunchly conservative ranchers. But it has also picked at the scab left from what local Anglos decry as the Obama administration’s “midnight” designation of Bears Ears National Monument in the county (which was later downsized by Trump). GOP candidates mentioned “the oppression of federal overreach” in their speeches, and convention attendees whispered about “the lands fight.” They talked about regulations and “the loss of our freedom.” The redrawn districts put in place by a U.S. District Court judge hundreds of miles away are just more of the same unwanted intervention. (Courtney Tanner | The Salt Lake Tribune) San Juan County Commissioner Phil Lyman speaks about running for the Utah House seat left open by Rep. Mike Noel's retirement on Thursday, April 5, 2018. “The federal government is the biggest threat we face in San Juan County,” said Phil Lyman. The current commissioner, a Republican, is running for the Utah House seat left open by Rep. Mike Noel’s retirement. His position with the county government was put in doubt with the new districts. And he has his own beef with the judge. Shelby presided over the 2015 trial in which Lyman was convicted of misdemeanor charges stemming from a protest ride up Recapture Canyon, which is federal land where motorized vehicles are prohibited. Lyman and others suggested that all of the County Commission seats be elected at large so the 16,895 residents could vote without being confined by arbitrary boundaries. That’s how it was done before a 1984 federal court consent decree — the outcome of an earlier court battle by Navajos to gain representation on the panel. Already, Shelby’s newly drawn districts have affected which candidates entered the race. Vint DeGraw, chairman of the San Juan County GOP, says the slim chance the party could win there is if American Indians don’t come out to vote on Election Day. Otherwise, he considers it a nearly certain loss spurred by “fouled up” redistricting, a sure setup to lose power. Most of the delegates thought that, too. They walked out of the Republican convention under the high school’s Buckaroos mascot banner looking dejected and disappointed. Even the American flag pennants and bows they had taped to the walls had slumped to the floor by the end of the two-hour meeting.